Melissa and Matt are one of my sweet 2018 couples, and I had so much fun meeting up with them to take their engagement pictures! We had to reschedule a couple times due to our unpredictable Ohio spring weather, but finally we got a lovely June evening and we took full advantage of it! We split their session between two beautiful locations, starting at Market Square in New Albany and ending at Inniswood Metro Gardens. Melissa and Matt were so fun and easy to work with, willing to try all my ideas, constantly making each other smile, and gosh are they adorable! Not to mention they have the sweetest dog named Sophie that they brought along for some of the pictures, and she is a complete heart-melter. (Shoutout to Melissa's friend Lauren for being our wonderful behind-the-scenes pup manager!) I could have photographed these three all night long, and I am SO excited for their wedding next spring! Enjoy some (a lot!) 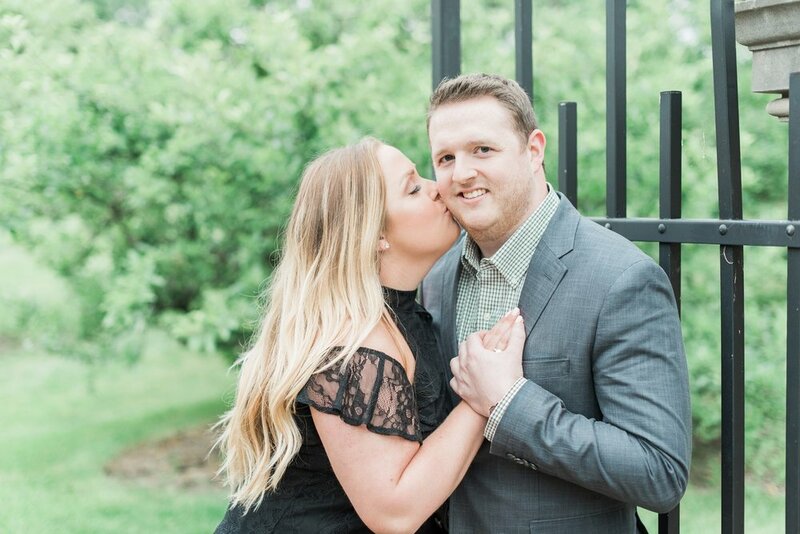 of my favorites from their engagement session!